I believe that it is both. I see evangelism as a series of kairos moments in a person’s life that have a cumulative effect of bringing a person to faith in Jesus Christ. These all work together to bring a person to a full awareness of the need for Christ. Yet Evangelism is also an event. I think of a particular moment in time where the evangelist can sow a seed such as one conversation. Or a different moment in time where a seed can be harvested — one conversion. Here is a reminder from Mark McCloskey, Tell It Often-Tell It Well: Making the Most of Witnessing Opportunities. (I’m guessing this book is out of print, though older copies are available still at Amazon). In Acts 18:4, Paul gives us an example of the process of evangelism. In Corinth Paul reasoned with the Jews in the synagogue every Sabbath, with mixed results. The leader of the synagogue, Crispus, believed, but many of the Jews “resisted and blasphemed,” until Paul felt it necessary to leave and set up shop in a personal home next door. The point is that Paul kept coming back to explain, clarify and reason with these people. Paul followed much the same pattern in Thessalonica (Acts 17:1-9). Over a period of three Saturdays he reasoned with them, explained and gave evidence that Christ was the Messiah. Luke says that Paul did this “from the Scriptures.” The idea seems to be that Paul progressively built a case for Jesus as the Messiah. Thus, his evangelism in Thessalonica could be described as a process. I have had many experiences like this. One young man in particular, John, would invite me to sit down with him almost weekly to explain more about Christ. He asked me many times to repeat things so that they would sink in. He asked me more than once to tell him how crucial this issue was and how he really needed to trust Christ as soon as he felt he could make a sincere decision. He was always eager to hear more, but for some reason the gospel never “clicked.” He later moved away, and I did not hear from him for a year. Then by divine providence, I’m sure, I ran into him. The first thing he told me was that he had finally put together all the pieces and that he had trusted Christ through the help of a friend in his new church. He thanked me for hanging in there with him. My evangelism with John was definitely a process of sowing, so that another could have the joy of harvesting. I would have been greatly amiss had I told John that since he was not ready to decide for Christ I did not have time to talk with him. The fact that a person is not ready to make a decision to trust Christ now does not mean that he is not serious about pursuing the matter. I need to meet him where he is and be a patient ‘sower’ in his life. I need to answer his questions, listen to him carefully, explain and clarify so that the issue of “Christ and Him crucified” is the only stumbling block to his receiving Christ. Misconceptions need to be cleared away so that the real matter at hand – “What will you do with Christ?” – can take center stage. Understanding evangelism as a process gives me the freedom to do this. 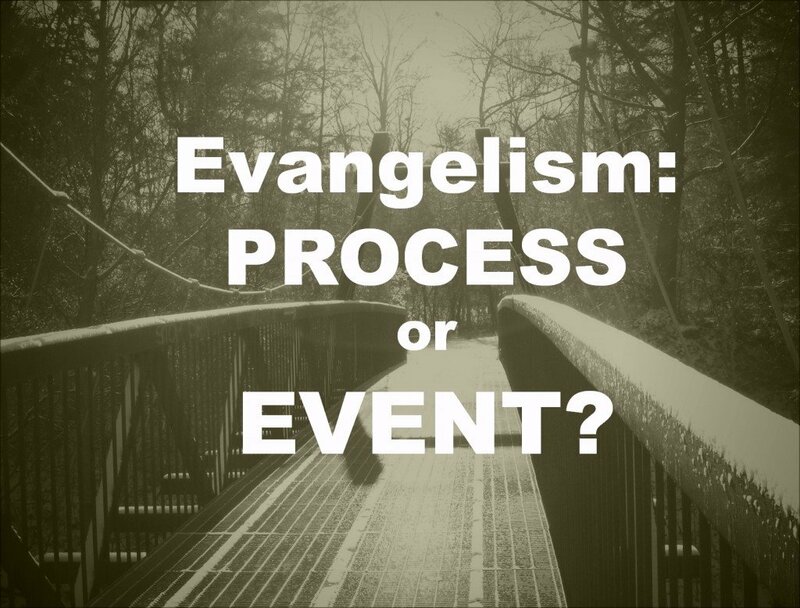 Whether evangelism is a ‘sowing’ process or a reaping event is not so much to be determined by the intention of the evangelist, but by the response of the listeners. For some in Thessalonica, Paul’s first Saturday synagogue message was an evangelistic event; an experience of reaping the fruit born by God’s Spirit. They believed the first time they heard the gospel. For others it was the first step in a process that took weeks or even months and years. Paul assumed the role of sower in their lives and it would be up to others to reap where he had sown. He appreciated the truth that, at any moment, as he sowed the seeds of the gospel, someone could have his last question answered, his last issue resolved, and he would then be ready to be harvested. The persuasive nature of the gospel demands that it be shared with a sense of urgency grounded in an awareness of this truth. The time for decision is always now. The danger is that the process can degenerate into a nonpersuasive dialogue that sacrifices the cruciality and urgency of the gospel for the sake of an expanded time frame. In such a context, it might be easy for both the evangelist and, consequently, the hearer to lose sight of the direction of their interaction. This is unfair to both the listener and the persuasive nature of the gospel. If you like what you have read, sign up for our weekly newsletter. You’ll get fresh articles each week from EvangelismCoach.org delivered to your email. Each week, I discuss and share articles about personal evangelism, church hospitality, and greeter ministry to help your church grow.